What a tough one this really is, especially for me because I am a planner, I like to know what’s coming down the road. Even though I know that what is meant to be, will be, no matter what, it’s still difficult at times to trust in that faith. I like change, I like the variety and I only like routine in specific areas of my life. Unfortunately having such distinct and particular ideas can make acceptance and trust hard to manage and something I still work at to this day. 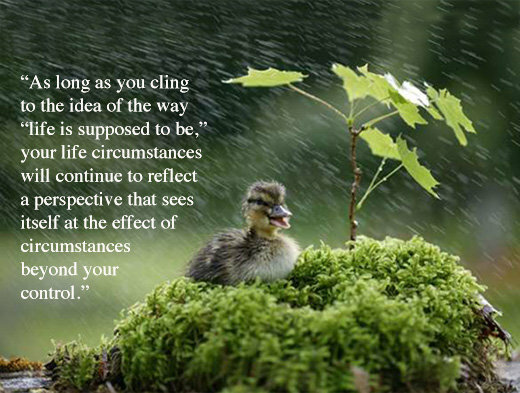 I have found that Wayne Dyers’ quote of “change the way you look at things, the things you look at change” has been significantly helpful when I remember to remind myself. Please click on the link I’ve just attached to view his you tube video, he is an irreplacable source of wisdom. When I’m in a state of being that is blocking my positive energy I find that sometimes I can’t summon the thoughts to carry me out of it. 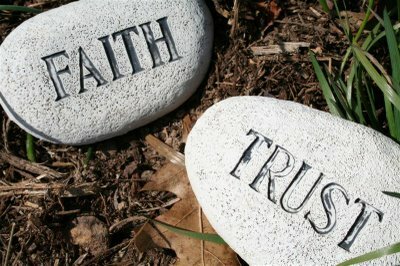 My two biggest detractors have been trust and faith that what is meant to be, will be, no matter what. My resistance to this, for whatever reason, will not change anything except to prevent me from finding resolution and peace sooner rather than later. In resisting I cause myself to stay in that state for longer and there is absolutely no benefit. I need to continually remind myself to let go, trust, have faith and stop trying to steer the course that is all part of the divine plan, a plan that I don’t know the outcome of. The moment I remind myself of this quote is the moment that everything shifts into the perspective it should have been in all along. I don’t think I could really explain it further, it’s something that you need to embrace to experience and something you can’t experience unless you embrace it. When I do embrace it and accept that “everything happens for a reason” I find that things don’t seem to have as much power over me anymore. It’s not that it’s no longer important it’s just that I’m reducing the impact it has on my life by changing the way I’m looking at it and in doing that what I’m looking at changes. It’s amazing how one little alteration of perception can change so many things, like mood, disposition, attitude and outlook. This could be the difference that determines what direction your life goes in. As much as I inherently know all of this it really is a “work in progress” to apply it to my life, especially when I allow my emotions to overrule my mind. I think it depends on where we are at physically, emotionally and mentally as to if certain circumstances are given more power than they should be at certain times in our lives. We’re not expected to be strong and resilient every single day, sometimes things can get to you and my reminder phrase when they do is such a powerful tool to have with me. I don’t believe that there is any one person that has all the answers we can only hope to learn from one another or through shared experiences. I have to allow myself to let go and trust in the higher power that I have faith to, and know that regardless of whether or not I like or dislike a situation that it is there to teach me something and in time that reason will be revealed as long as I have faith. Allowing that faith doesn’t mean I’m giving in or giving up it means I’m letting go of what was to allow what is. 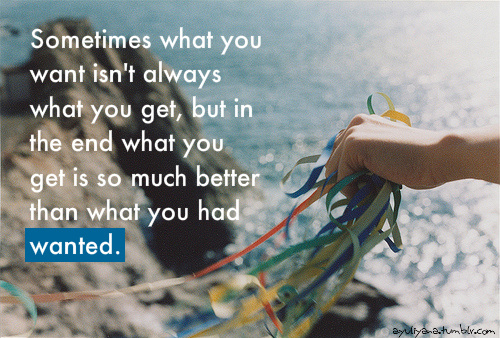 Sometimes when you’re looking for answers, letting go is the only way to find it.